Although I am only in my early 30s, I had identified very much with the “midlife funk” that Suzy refers to. As a physician, during the time spent in school and training, I had lost sight of my priorities and passions, and had felt very dissatisfied in my work and presence at home. I was feeling overwhelmed, and negative thinking about the various aspects of my life were leading me to consider leaving my profession to find the work-life balance that I much desired. I reached out to Suzy in a last attempt, to see if I could finally start to gain some clarity about who I was and what was most important to me. I needed to see if there was a way that I could continue to practice medicine and achieve the happiness in my personal life, and achieve the goals I set for myself. Suzy has an open and compassionate approach, an ability to help me come to my own realizations, and provides guidance when needed. The strategies used to help change how one thinks are simple, but to me are mind-blowing in their impact. I continue to be amazed at how I can implement these in every aspect of my life, and in as little as 3 months time, I have noticed immense impacts on my happiness and productivity. I have recognized that my happiness is within my own control, and with focusing on the process involved in getting to my goals, and believing that I can achieve anything I set my mind to, I am finally starting to live and create the life I had always wanted. With enthusiasm, I would recommend her to other physicians and professionals who are looking for more satisfaction in their work and personal lives. Working with her has been life-changing! I highly recommend working with Suzy if you would like to receive expert coaching on how to elevate your life on any level. The many levels that she helped me to unpack and rise higher in included career, romance, weight loss, and, most importantly, my overall thought patterns. 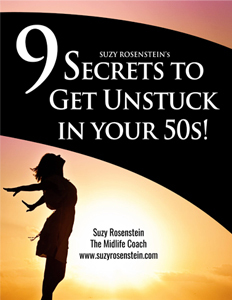 I particularly urge midlife women to contact Suzy, as she has experienced this transition herself and can provide encouraging and constructive insights. Thank you, Suzy, for all I have learned in our work together! Coaching with Suzy was amazing! As a recent University graduate who has had to go against the grain of what my peers were doing, Suzy really helped me to realize that the path I am on is meaningful and fulfilling and exactly where I need to be right now. She really helped me pinpoint my negative thoughts that were holding me back. It was a really cool experience to be able to go through her exercises and feel the feelings and thoughts they evoked and be able to communicate them. Communicating them really helped me address the thoughts directly and be able to identify the causes of them. Before I just experienced the thoughts as they came to me and let them take my emotions where they would, but now I feel as though I can identify the harmful thoughts and put an end to them before they run amok. With the new phrases and thoughts we worked on I feel much better about where I am in life and how to further achieve my goals in the future. I very highly recommend coaching with Suzy! Thank you so much! Suzy was a joy to work with over 6 sessions. I looked forward to our weekly check-in. She held me accountable to my commitments to keep me progressing. Suzy encouraged me to reprioritize, initiate difficult conversations to move forward, challenge my thinking and list my goals. Here’s to now realizing them! I had the privilege of being one of Suzy’s first clients as she started her life coaching practice. I was feeling very stuck and knew my job was no longer bringing me the satisfaction it once did. I had contemplated a change many times over the years, but the courage to follow through had never been there. I hate change. I like my routine. This was what I knew and I could not see a different path. Suzy led me through the thinking I needed to generate viable alternatives. Her enthusiasm is amazing, and I likened her to my personal cheerleader. I did nothing immediately. Life then led me down a road I could not have foreseen and her words came to the forefront. I did leave my lifelong career to pursue the passion I had as child, writing. I will be publishing my first book soon. Thank you Suzy for your professional support and coaching! I was not sure what to expect when I signed up for Suzy’s coaching session package. I have done a lot of work on myself over the years, and am familiar with many concepts on how our thinking creates our realities, and how it is possible to change it. I didn’t want this to be the same things I already have “struggled” with. I also know that in order for something to be truly helpful, I must be ready to make changes and be open to trying new things. Somehow, working with Suzy made that process happen in most natural way that was very comfortable for me, and I am happy to say, that desired changes are indeed happening! Suzy listens intently, is intuitive to what she hears, and therefore can truly coach you to look at whatever it is you want to accomplish in the sessions. I highly recommend her! Through thoughtful questions about my life – past and current – and through discussion about my passions, Suzy, helped me think positively about my unexpected midlife career change. She left me feeling ready to face this new life challenge with excitement and optimism. Working with Suzy was an interesting and exciting prospect for me. I went into the course very skeptically (I had never participated in any life coaching programs before) and finished feeling that we had accomplished a lot. It didn’t take long for me to feel very comfortable talking to her about serious issues that you don’t get a chance to discuss in everyday conversations, even with those close to you. The program she takes you through is structured in such a way that each step builds on the previous one so that you can build a strong foundation for moving forward with your aspirations. What I really enjoyed was examining suppositions that I’d held so dearly and seeing that they weren’t necessarily true and could be holding me back. All this was done in a caring, professional manner that made me look forward to the next week’s session. For anyone at a crossroads and feeling overwhelmed, I would highly recommend Suzy’s program. At the conclusion I felt energized and focused. I’m so pleased that I decided to give it a shot. It felt great to have someone listen without judgement. I felt really comfortable discussing some sensitive topics that had been bothering me for a while. I needed to take action, but felt too overwhelmed to figure out where to start. The very best part of our session was how you helped me to think “outside the box” and realize all the other options I have! Suzy really helped me to identify areas of my life that badly needed my attention, to set priorities, and to find the courage to face areas I’d been avoiding for months.I felt constantly supported by Suzy, but also strongly encouraged to rethink some of my fixed ideas. Suzy had a knack for sensing when we were focused on the most salient aspects of my challenges and refused to budge until we had teased apart what was keeping me stuck. It was fun to work with Suzy. I felt that she was sincerely present and interested in my well-being. At the end of our six sessions, I feel more grounded in my life and far more hopeful about my future. Suzy asked insightful questions that helped me clarify what I needed to do to move a new venture forward. Suzy really helped me to take a more relaxed approach to doing household tasks. She was personable, listened carefully to my concerns and gave spot-on suggestions. At a pivotal crossroads in my life, I turned to Suzy for a few coaching sessions. Her questions are relevant, probing, thought provoking and stimulated profoundly important self-exploration. She has a tremendous ability to focus in, with insightful clarity, on what really holds us back, what the big picture problems are and direct pathways to access results. Working with Suzy has enabled me to shifted gears and my mindset. I now have a whole new career which has taken off in ways I never expected! In recently working with Suzy (my first experience with life coaching), I have learned that life coaching makes complete sense in that it has effectively assisted me in viewing my present day life and thought processes from a completely different perspective. My experience with Suzy has been nothing short of eye-opening, informative, reflective and incredibly thorough. Suzy’s personality was wonderfully suited to my personality. She was able to guide me in extractingthose feelings and thoughts that were igniting negativity in my life and move forward with a clearer understanding on the steps that can help toward moving in the right path and ultimately live a happier life. She is patient, kind, logical, intelligent and has been a very effective and superlative coach. I would recommend her to anyone interested in delving into discussions on thought processes to seek success at attaining success at making desired personal goals a reality.